Father’s Day is coming up, and since you already got Dear Old Dad the handy book version of Mets by the Numbers(you did, didn’t you? ), and you know how much fun that was, don’t be stumped for a follow-up. My friend and co-author for that work, Matthew Silverman, is out with a fresh take on 100 Things Mets Fans Should Know and Do Before They Die (Triumph, 2010). This revised and updated copy, which tells the story of the Mets in 100 bite-sized chunks, is loaded with fresh picks at the scabs of recent seasons (the Shea closing ceremony, a Molina vs. Scioscia debate) amid essential pieces on Met trivia, Met stories and Met activity, from Buckner to Benson (Anna, of course). 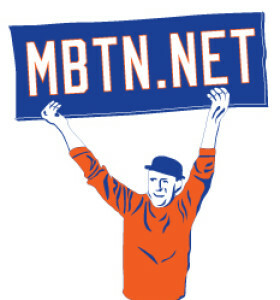 You can find it your local bookstore, or on-line, or get a copy personally inscribed by the busiest Mets writer on the web at MetSilverman.com. Had a great time over the weekend down in Baltimore where the Mets finally did what they’re supposed to do to a struggling team: Kick ’em while they’re down. The city was filthy with Met fans including a duo I spotted Sunday wearing jerseys bearing the names and numbers of Kelly Stinnett and Dave Telgheder. (In their 1995 versions: 33 and 40, respectively). I don’t know why I didn’t shoot a photo of these guys or at least say hi, but if you’re out there: I tip my hat to you. Not that a team whose history would produce such fans ought to be taking pity on anyone, but it was kind of sad to see Baltimore so beaten down as a baseball town. I was a Marylander when that park opened and you couldn’t buy a seat weeks in advance: Here they were badly outnumbered by the enemy and the place was half-empty. If there was a franchise that cried out for the kind of jolt Bobby Valentine could provide, this is it. Then again, the Angelos-led organization fumbled away a previous great leader in Davey Johnson. Submitted by metsilverman.com (not verified) on Mon, 06/14/2010 – 10:21pm. Following your exploits on Bmur. Went to college with a lot of people from there and even got to Memorial Stadium, but Camden Yards was worth annual reunions for most of the 1990s–sometimes I even drove down twice or flew on a discount puddle jumper. Forget it now. Last time two times I went they were playing the Red Sox and it was depressingly anti-O’s. The Yankees games were so bad I wouldn’t admit to people I was from New York. The bars around the park were great, the Babe Ruth Museum was awesome, and I liked the crabs so much I had a box same-day shipped to my house for a dinner party (only $3 per blue in ’99 dollars), and the people just loved their baseball. I whine about it a little more on my site. Also wanted to say thanks for the 100 Things plug. All things considered, I’ll take the Camden sweep but I’d love to see Bobby V. make them matter again. Submitted by Dave Mackey (not verified) on Mon, 06/21/2010 – 10:35am. Jenrry Mejia sent down to Binghamton. Bobby Parnell is back with the Mets still wearing 39. Submitted by Anonymous (not verified) on Tue, 06/22/2010 – 10:05am.